Several generations grew up with these precious little discs containing musical wonders. 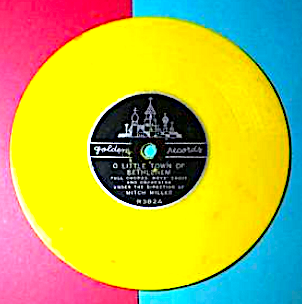 From six-inch 78 RPM discs to 45 RPM singles and LPs to cassettes, Golden (and then Wonderland) Records were a major contender on children’s records shelves. The biggest names in entertainment, music and theater lent their talents to these records. Cartoon favorites became popular in the early ‘60s, sometimes using original casts, sometimes with “sound alikes” (which were controversial to fans). Millions were sold and countless young lives were enriched. A handful of these albums are available on CD, and others are downloadable — not even close in number to the full catalog, but a representative amount — and Shout! Factory, with a little assistance from my own self, released two volumes as a nice buffet sampler. Some of these selections had not been reissied in over six decades Among them those feature Shari Lewis, Mighty Mouse, Popeye, Roy Rogers, Dale Evans, Jimmy Durante, baseball's Mel Allen, Cliff "Jiminy Cricket" Edwards & more. 28 songs in all. • The fantastic Jimmy Carroll version of "Carousel Waltz" never before on CD and a version unlike any other. • A totally different version of "Give a Little Whistle" recorded for Golden by Cliff Edwards. • Roy Rogers and Dale Evans singing the song later made famous by Pebbles and Bamm-Bamm on The Flintstones. • A moving rendition of "Hi Lili, Hi-Lo" by Shari Lewis. • The definitive "Popeye the Sailor Man" that Robin Williams duplicated note-for-note in the movie. • Rosemary Clooney's sister Betty singing "Fuzzy Wuzzy." • Mel Allen "calling the game" when Casey went to the bat. • Art Carney, at the height of "Honeymooners" success, singing Frank Loesser's "The Ugly Duckling." I have to add a mea culpa caveat to those of you who are more expert than me in some of the facts in the notes; that may by Roy Halee and not Tom Morrison singing for Mighty Mouse as listed, I'm not sure if those are the ball players in the chorus of "Take Me Out to the Ballgame, and yes, that IS Paul Tripp singing the "Tubby The Tuba" song. Because of time constraints, some little nits are present, but please if you will focus on the magnificent big picture of so many mini-masterpieces.